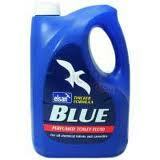 4 litre Elsan Blue Perfumed toilet fluid, suitable for all chemical toilets, waste holding tanks and cassettes. Kills germs, prevents odours and is the most effective way to keep toilets clean and fresh. 4 Litres of Elsan Blue Perfumed toilet fluid, suitable for all chemical toilets, waste holding tanks and cassettes. Kills germs, prevents odours and is the most effective way to keep toilets clean and fresh.